Credit: M. Zubkov et al. 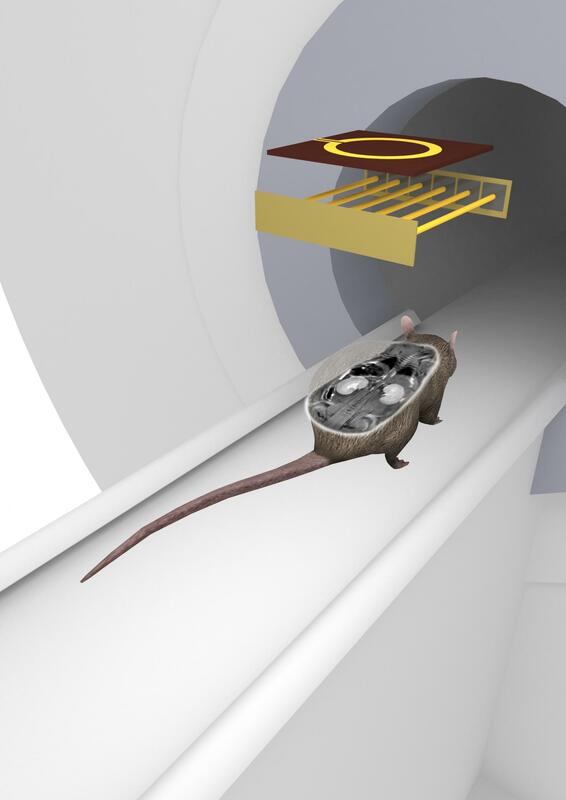 Researchers from ITMO University developed and tested an MRI coil providing high-resolution imaging of the whole body of a mouse. Such coils are used in preclinical testing, as well as in imaging of various body systems. The new coil produces images with three times higher resolution than standard commercial volume MRI coils. Scientist used inexpensive materials and manufacturing technology that may be adjusted for various research projects. The research was published in NMR in Biomedicine as the cover story. Whole-body MRI is used in diagnostics and for preclinical studies of drug response assessment. Preclinical studies are typically conducted on animals, for example, on mice. Despite the small size, obtaining a high-quality image of the whole mouse is not as easy as it seems. The problem is that usually to get images of the whole body, one has to either combine the images from several small receiving coils, or use big standard coil for both emitting and receiving. In the first case, the imaging procedure becomes complicated, while in the second one, the image quality deteriorates so that it becomes difficult to distinguish important details. To solve this problem, scientists from ITMO University have developed a new type of an MRI coil. New coil design features make it possible to get high-quality image of the whole mouse easily. First of all, the coil size is specially adapted for scanning a mouse, which helps to avoid extra noize. Scientists managed to reduce the coil size by using a metastructure with a distributed capacity. At the same time, the alternating magnetic field intensity of the new coil is much higher than the one of standard coils. This provides a higher sensitivity of the coil in the entire field of view and improves the image quality. "Standard coils are tuned to a particular frequency using non-magnetic capacitors. They introduce internal losses, reducing the signal-to-noise ratio. This is one of the main parameters used to determine the image quality in MRI. Since our coil is self-resonant, we do not need any capacitors. We can tune the coil by changing the geometric parameters. Also, new design allows us to optimize how the coil works, increase its sensitivity and image quality. Besides, the cost of raw materials is low, and the manufacturing technology allows us to adapt the method for various projects," says Anna Khurshkainen, a graduate student at ITMO University, member of the Laboratory of Nanophotonics and Metamaterials. According to the scientists, the work began with a numerical modeling. This helped to optimize the geometry of the future coil and choose the materials. After that, the researchers made a prototype coil and conducted experiments. "We measured the signal-to-noise ratio in different parts of the image at different distances between the object and the coil. The obtained results were compared with mathematical simulation and experimental parameters of standard volume coils. It turned out that there is an optimal distance between the image and the coil, at which our coil provides the image quality three times higher than the standard one," adds Mikhail Zubkov, a researcher at the Laboratory of Nanophotonics and Metamaterials at ITMO University. Currently, scientists plan to continue working on a variety of coils for various preclinical studies.